• There are 284 rooms, 31 suites and a Sultan suites. • Laledan restaurant, Gourmet Tugra restaurant, Russian Caviar bar, Gazebo Waterfront Lounge, Ciragan bar. • Outdoor pool and an indoor pool, a Turkish bath, a massage room, a jacuzzi, and a sauna. • Located opposite the Bosperus river. 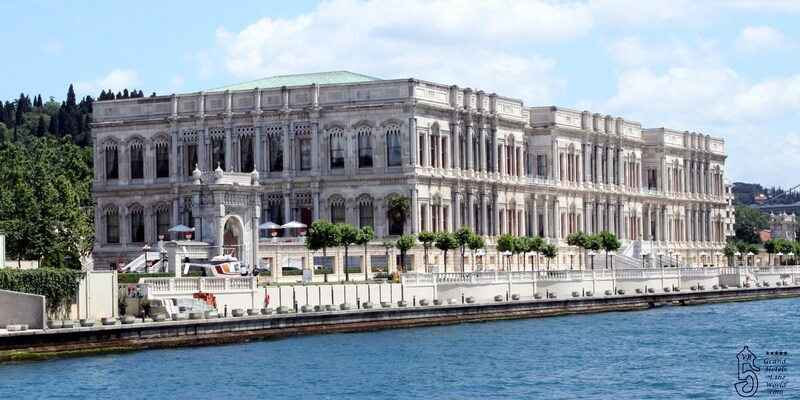 • 1836: Palace built by Sultan Abdülâziz with help of the architect Nigogayos Balyan. The inside was made in wood, the outside in colorfull marble. • 1869 December 4: Emperess Eugenie of France (wife of Napoleon III) is visiting the Ciragan Palace. She was on her way from Egypt where she had just inaugurated the Suez Canal. • 1872: Construction and decoration completed. • 1877: The sucessor of the sultan, Sultan Murad V moved in. • 1909: The Turkish parliament is allowed to hold meetings at the palace. • 1910: The palace is destroyed by a big fire, only the outer walls remain. • 1946: The Parliament gives the palace to the municipality of Istanbul. the ruined palace is used a a football stadium. • 1989: Aquisition of the Ciragan Palace by a Japaneese investment consortium. • 1999: Conversion into a Palace Hotel under the prestigeous Kempinski lable. • 2007: New renovation of the Ciragan Palace. • 2013: The Ciragan Palace receives the 5 Star Diamond Award. • Ownership: Abu Dhabi Investment Authorithy (ADIA).